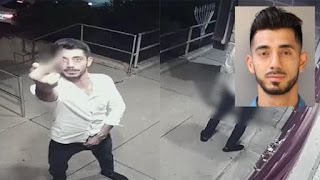 On Tuesday night, Dzhalilov, 23, of the 2100 block of Hoffnagle Street in the Rhawnhurst section of the city, turned himself in to Northeast Detectives and announced that he was the man seen on the surveillance recordings desecrating the synagogue. The footage, released by investigators Monday, shows a man dressed in a white shirt and dark jeans walk up to Congregation Beth Solomon at 198 Tomlinson Rd. about 12:30 a.m. Sunday and urinate on the front door and the sidewalk. After emptying his bladder, he leaves in a white sedan, but not before making an obscene gesture toward the surveillance camera. The man’s face was clearly visible. In an interview Wednesday night, Rabbi Solomon Isaacson, founder of Beth Solomon, said he was relieved that a suspect was in custody. Beth Solomon has been vandalized two other times within the last 12 months. “We need to thank the police. They did a terrific job,” Isaacson said.